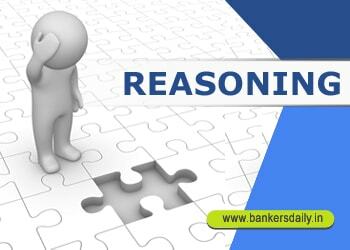 The End of the Exam season of the year is near and finally we have to make our preparations in a stronger way therefore achieving our dream of becoming a banker in the forthcoming days. Yet the exams happened in the recent days were both in the easier and difficult range. The IBPS CLERK PRELIMS EXAM result will be announced in the forthcoming days and you have to take your preparations to the next level because the competition will get intense and so you have to make your strategy and preparation ways in addition to the success rate. This will consequently reflect in your result performances. Therefore we are providing this important question set daily to make your preparations to the next level. Especially this will be really helpful for those who still needs to practice more number of questions for the exams. Attend these questions and take your preparations to the next level. Each of the questions below consist of a statements below it. You have to decide whether the data provided in the statements are sufficient to answer the question and mark the appropriate option as answer. 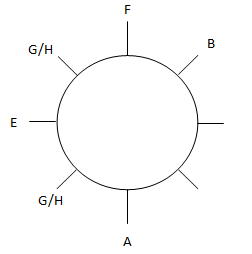 Q.1) A, B, C, D, E, F, G and H are sitting in a circular table and all are facing center. 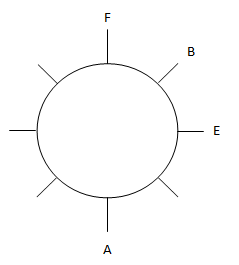 What is the position of E with respect to B? I. B is third to the right of A. F is an immediate neighbour of B.
II. The person who is second to the right of F is facing E.
III. The person who is second to the left of A is not facing F. E is immediate neighours of G and H.
Q.2) P, Q, R, S, T, U and V are living in seven different floors. Ground floor is numbered one and the above floor numbered two and so on. Who livesthree floors above T? I. P lives on the even numbered floor. Q lives two floors below P. V lives neither adjacent to R nor on the topmost floor. II. Two persons live between T and R who lives on the even numbered floor. III. As many persons live below V as above S.
Q.3) Six persons E, F, G, L, M and N are in different height. Who is the tallest person? I. M is taller than G and shorter than E who is not the tallest person. II. F is taller than N and G only. III. L is taller than E and not shorter than M.
Q.4) A, B, C, D, E, F and G are sitting in a row and all are facing north. Who is sitting at left end of the row? I. Two persons sit between D and E who is second to the left of C.
II. G sits second to the right of D who is not an immediate neighbours of C.
III. B sits right of C. F is not an immediate neighbourof D.
Q.5) A, B, C, D, E and F are members of a family. How is F related to B? I. A is mother in law of C who is mother of F.
II. C is sister in law of D who is daughter of E.
III. C has no sibling. 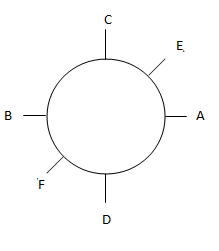 Q.6) Six persons A, B, C, D, E and F are sitting around a circular table facing inside. Who sits second to the left of C? I. Two persons sit between C and D. E is an immediate neighbour of C.
II. Two persons sit between A and B who sits second to the left of D.
Q.7) Among five persons P, Q, R, S and T who got the third lowest mark? I. Q got more mark than R and T. Neither P nor Q got the highest mark. II. P got more marks than Q and R.
Q.8) How is W related to R? I. Z is the sister of Q. Z is the mother of R. W is father of V. A is grandmother of R.
II. T and V are brothers. V is married to W. V is brother in law of R.
Q.9) Eight persons G, H, I, J, K, L, M and N are sitting around a circular table facing inside. 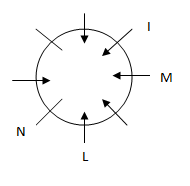 Who sits immediate right of M? I. Three persons sit between J and K. K sits third to the right of L. Only one person sits between L and M.
II. L sits immediate right of N. Only two persons sit between N and M who doesn’t sits opposite to L. I sits opposite to N.
Q.10) How is ‘level’ coded in the code language? II. ‘land to dry’ is coded as ‘ma vaba’. ‘fire exit’ is coded as ‘sa pa’. You can check the answers for the above questions from the link given below. Probably scoring more in this simple one will give you greater confidence to attend more questions in the exam, furthermore this will enhance your speed too. We can’t find the gender of F.
Check the important Sequential Output tracing questions which are asked in the recent exams in the link that is given below. You can also check the other Data Sufficiency Questions which will be useful for your preparations.